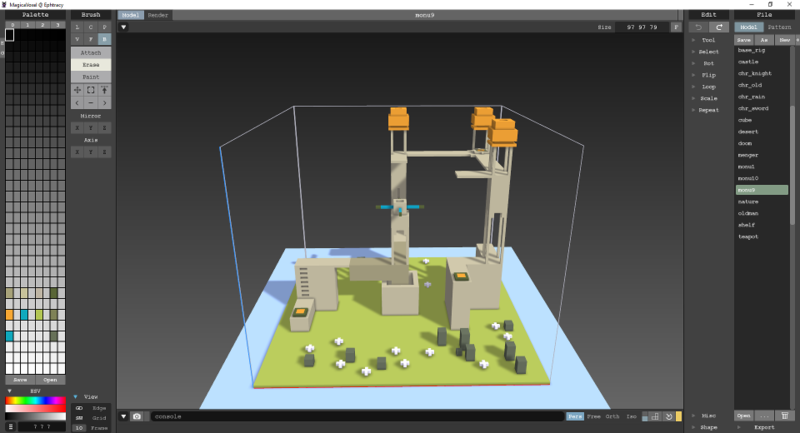 So I’m testing a bit of code I encountered regarding procedural meshes, creating shapes directly into UE4 by just loading cube geometry from this nice little voxel program called MagicaVoxel. Result is satisfying with little or no optimization. But the real sore thumb is the lighting. 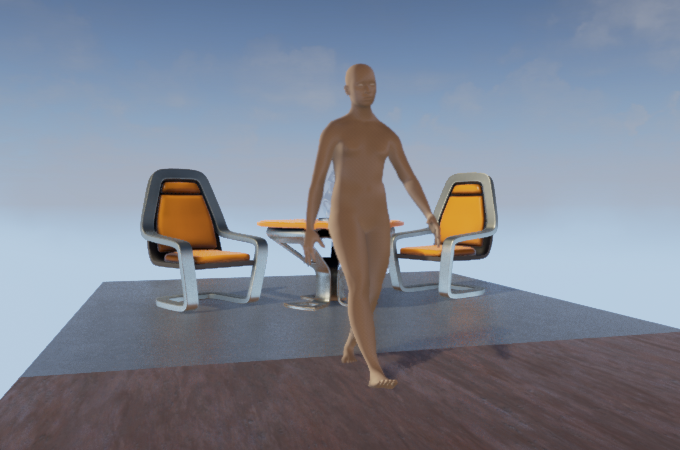 Dynamic lighting in UE4 creates darker shadows (Sky Light doesn’t help, but I believe the tool is geared towards static meshes, not dynamic ones). So I’m using 2 directional lights, one with shadows, the other without to bury the darkness. But when objects are getting other meshes’ shadows, the darkness returns. 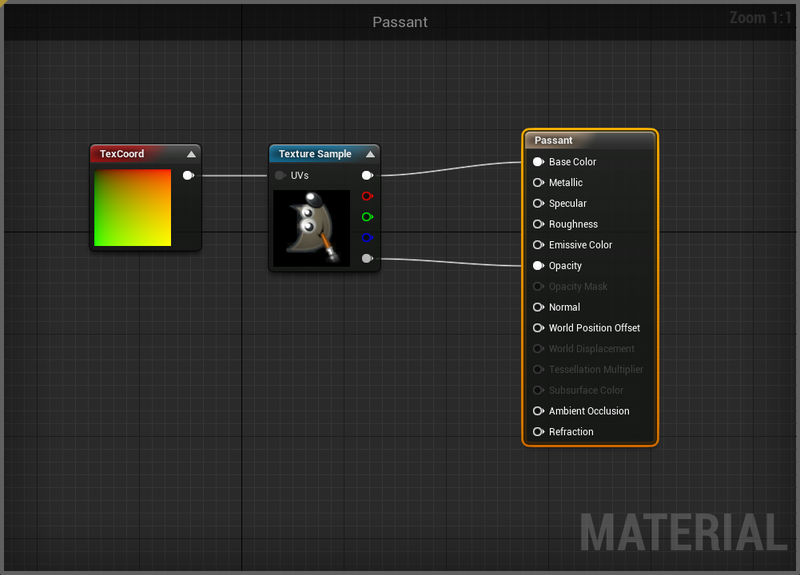 And generally, not just because of using 2 lights, the overall colours are a bit bland compared to the original. Still it’s “workable”, it doesn’t stop me from pursuing other goals. I’m going to test either Perlin noise or Simplex noise to generate random terrain. The picture below must look strange to you: A poor sod being looked upon a group of billboard-carrying Wilber aficionados. 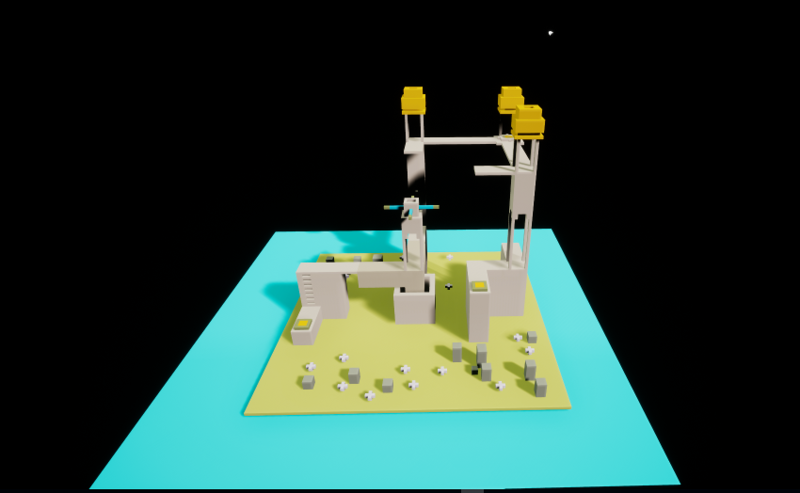 Like all tutorials gone wild, I had some fun improvising on the Blueprint tutorials from the Unreal Team. The example here is focused on mass-producing a series of attributes and behaviour into one object – a Blueprint – and then drop as many as I want into the scene. 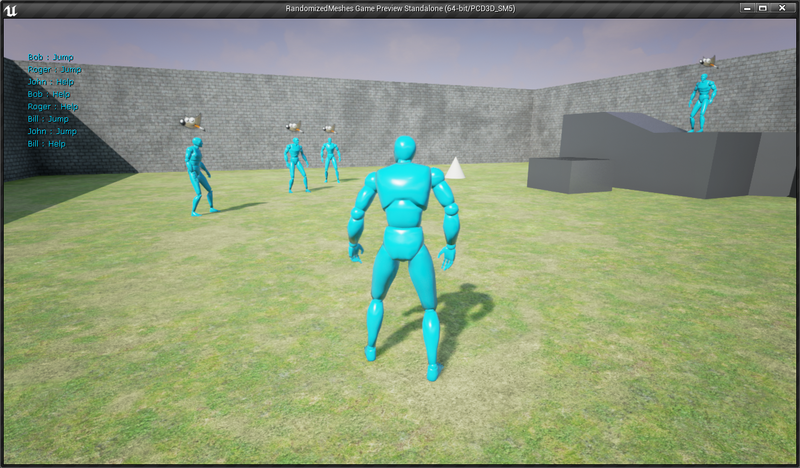 So here we see the famous UE4 Blue Man in idle position. Around him is a capsule that prevents the player to go through him and an additional box that is used as a trigger when my player enters his “personal space”. Once in it, I can then use some key to trigger an interaction between me and the character. The ‘Wilber’ (the GIMP’s mascot) on top of the head was a funny thing. It’s my first try in billboards and I’m currently using the one that’s built-in the characters blueprint. I originally wanted to write names and professions over each character’s head when I figured that dealing fonts and transparencies isn’t that easy. So I went with something simpler, like having this iconic mascot with transparent contours. I happy with the “always-facing” part but it needs to be less geographically located on the Z axis (or whatever axis that may be since UE4 uses Z for “up”). I still have issues with it. 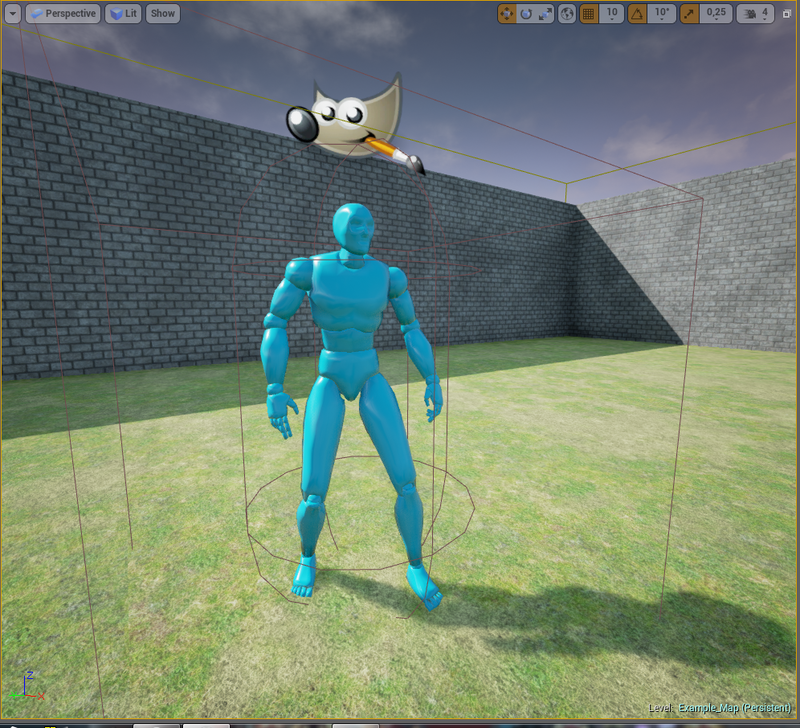 Unreal fails to load a 32-bits PNG file with transparency into the asset editor directly. So I got the simple DirectX texture tool, loaded the PNG into it then saved it as a A8R8G8B8 format. When I load it, the texture is now considered as a DXT5 file but it still kept it’s alpha channel. I finally got transparency when I took the alpha channel and connected it to the opacity property with a translucent blend mode. I’m not sure if this is the best way but it will suffice for the moment.